Little Dragon poses for a shot on the streets of San Francisco. 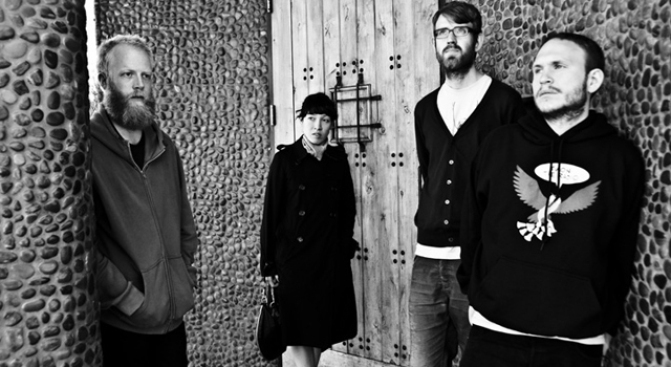 Little Dragon is a Gothenburg, Sweden based band that has been one of music lovers’ best kept secrets of the last couple years. With swinging electro-synth tracks and soulful yet at times haunting vocals of lead Yukimi Nagano, Little Dragon’s sounds have put many in a blissful trance, including myself. The band consists of Håkan Wirenstrand on keys, Fredrik Källgren Wallin on bass, and Erik Bodin on drums. Yukimi is known to get down on a little percussion as well. Between the concept of their debut music video for “Twice” extended into a short film that showed at Cannes, a soundtrack feature on Grey’s Anatomy, and a recent tour with TV on the Radio this spring, Little Dragon is coming to spray its dragon breath in an ear near you. Bay Area photographer and writer Seher Sikandar sat down with the fun and quirky bunch where to talk about tourettes, the recording process, and fruit before their San Francisco show. High school crushes and drugs, too. You know how we do. I read that you all went to high school together – that’s awesome. What was life like in those days? What would you guys talk about and dream about? EB: [to Yukimi] And I thought you were really cute. [Yukimi laughs] But really, she was the only one of the girls – and boys – who was singing that sort of got a spell on you right away. She had the magic already, back then. [sings “I got a spell on you”] But I remember the first time we all started playing, we were fourteen or something and Yukimi came with a red gothic outfit with this amazing deep voice. So in high school you all were already kinda jamming out and stuff. EB: Yeah, we formed a little band in high school. YN: I think we were all pretty determined that we wanted to play music in our lives, but it wasn’t until afterwards that we formed the band [Little Dragon]. It was pretty easy since we all had lived together in a collective and we knew each other so well – so it just kind of happened naturally. Although a simple animation, the “Twice” music video was very entrancing and captivating for me and a lot of my friends that watched it. I’m curious to hear the story/concept behind the video and the song. YN: Well, actually the guy that made that video made a short film out of that. He kept that animation from the video and made it longer – so it’s eight minutes now and it’s gonna be in Cannes. And we made music to it [the extended video] – Fredrik did most of it. It’s very different from the song and feels like it’s very dark – it’s more focused on the film. EB: But the video was more, uh, yeah we don’t really know what it’s about. YN: [laughing] Wait til you see the whole film, there’s more – the story goes on. EB: Yeah, great. And he [the director] has this very mystical smile on his face. He’s a very special character, Johannes, who made the video. It’s about his life maybe, who knows. Your music is very visceral and evokes a very tangible mood. Ethereal. How do you feel when you perform? YN: Well, when we perform I think it’s very up and down. Most of the time it’s good but sometimes it’s awkward and you know, maybe you’re getting a weird vibe from the audience or people don’t know who you are and they’re in some sort of strange mode trying to figure out if they like you or not – and you can get a little too self conscious at times. But then we’ve had a lot of wonderful, amazing shows that make you feel like everything’s worthwhile. What’s it like when you write and when you record? YN: In the studio, I think we’ve just been wanting to be inspired by music. Like, we just feel so bored by music we hear on the radio and commercial music; we wanna make music that we wanna hear. I mean, at least – I’m not sure if it always comes through – but to have an ambition of making something that sounds a little bit innovative. EB: I guess when you’re getting to the point where the song is close to taking shape, you know, it feels like magic. Really, you want to hear it over and over and over again. YN: And you go, “Really?” And then, you know, you just keep working on it, and…it’s kinda the process. YN: But I think we all can get really happy and high when we’re in the studio. I don’t know if we all think about it really, but there’s nothing as fun as when you feel like when you have an idea of a song that feels really good and you’ve listened to it long enough to know that’s it’s not just a momentary feeling. And you can turn all the lights off in the studio and crank it up – like, listen and nobody’s heard it. It’s different once you decide that it’s going to be on the album and people are gonna work with it, then you start getting more cold feel and afraid of what people are gonna think and, “will people like this?” But when you’re in the studio, then it’s just kinda for us and it’s a real buzz. Spending so much time together and being such old friends, you must know each other quite well. What idiosyncrasies and quirks have you learned about each other along the way? YN: I think everyone has their sides. HW: Fred has a funny habit. Ginger instead of tobacco? What exactly does the ginger do? FW: Yeah, perfect chemisty. It’s kind of a buzz. Håkan has this funny thing: whenever he sees pasta on the table, he rubs his belly. EB: And he’s very talented in scratching his head and beard when he’s thinking, which he always does before he opens his mouth. It’s an art form. A friend used to ask everyone this question when I was in elementary school: If you were a piece of fruit, what would you be and why? FW: There’s this honey mango or something from India or Pakistan...in Sweden they call it a honey mango. FW: Its really yellow, super sweet. So Fredrik, do you want to be a sweet mango? YN: Cause it’s so sweet. FW: Cause it’s so sweet, yeah. Cause they’re exclusive [laughing]. Expensive [more laughing]. You’re expensive? I’ll keep that in mind. FW: And they’re super soft when they’re really ripe. So you’re soft – you seem like a mild mannered person. EB: I would be a banana. Just because I have tourettes. How do bananas have tourettes? EB: [defensively and confused] I don’t know?! If you don’t have tourettes, you don’t know why you wanna be a banana. Or a mango, any mango. EB: Noooo! You wanna be the special honey mango, I’m just a proper mango. EB: Cause it’s the king of fruits. That’s not a fruit! She’s an ice cube that all your fruit sits in…? YN: I would be a lime. YN: Cause you can do so much with it [laughing]. You can make mojitos, caipirinha. Caipirinha! Everyone talks about that drink – what is it? YN: It’s Brazilian. It’s like…rum and brown sugar and lime – it’s like mojito without the mint. So a lime because it’s versatile? And a little bit sour? The group’s sophomore album, "Machine Dreams," is due for release in mid-August. Get ready. Seher Sikandar is a Bay Area-based photographer and writer who covers art and lifestyle events. Check out her portfolio at rehescreative.com.